In the first half of the nineteenth century, France was a world leader in the design and construction of suspension bridges. And yet today not a single one of Paris’s nineteenth-century suspension bridges over the Seine remains. Why? It was the image below that got me interested in this question. When a friend let me browse through his collection of early stereoviews of Paris, I found the following stereocard. This old, faded photograph shows a very unusual bridge. Moving from right to left, we see three arched masonry spans. Above the top of the final masonry pier there is a short stubby tower that is part of a suspension bridge. This bridge continues on to the shore where a higher tower also supports the cables. What was it? Where was it? I e-mailed the photograph to people I knew in Paris. Nobody had seen it before. One day in Paris, Philippa and I were having lunch in a crowded Parisian bistro with Adam Roberts, who writes the Invisible Paris blog, and we showed him an enlarged version of the image. He had never seen it before. The waiter and the two Parisian men at the next table also took a great interest in the photograph and an animated discussion ensued. The quest was good fun, but the mystery bridge was still a mystery. Along the way, a retired bridge engineer friend told me about the 1839 bridge shown below, the Saint André-de-Cubzac bridge over the Dordogne River. It is one of many astounding French bridges from the early nineteenth century. The Bridgemeister website where I found this image rightly describes it as “perhaps one of the most fanciful suspension bridges ever built.” Looking at it, I wondered more and more why suspension bridges had vanished from Paris. Then one day I found and bought the stereoview below, showing a suspension bridge. 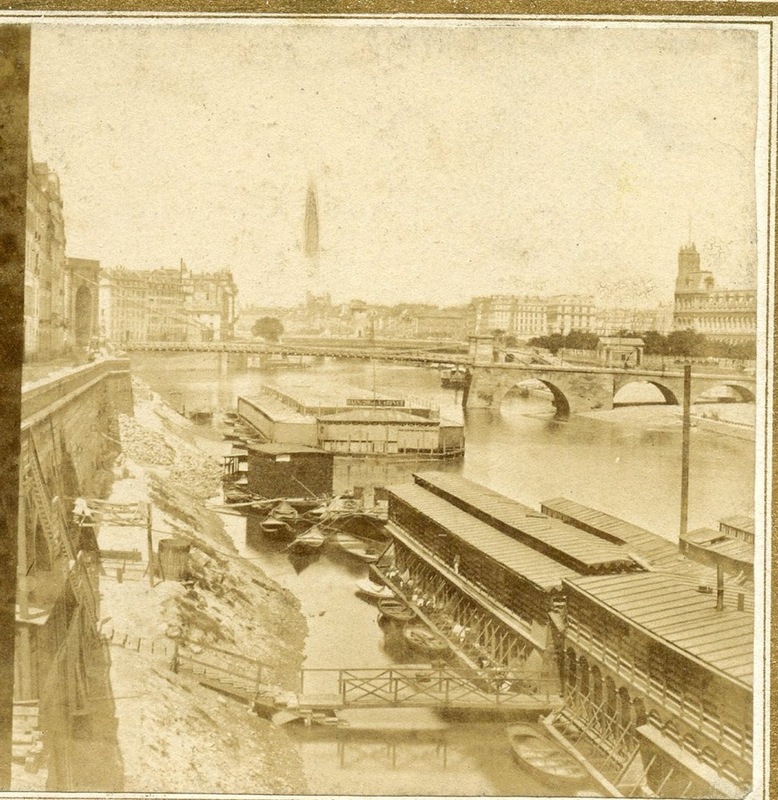 The handwriting on the back identified it as Pont Louis Philippe, Paris. It certainly wasn’t anything like the Pont Louis Philippe that stands today. But now I had a starting point for my research. And very quickly, I made some startling discoveries. The woodcut engraving below leaves no doubt that it is the same bridge that started the whole quest. My sincere thanks to the creators of the website Art et Histoire where I found this image. I also found this lovely pencil sketch from 1840. Once I had a name for the bridge, a story emerged, only slightly confused by the fact that today there is a masonry bridge by the same name at almost the same spot. The current bridge crosses the River from the point at which the Rue du Pont Louis Philippe meets the embankment of the Seine to the Ile St-Louis, where it runs straight into the rue Jean du Bellay on the island. The suspension bridge took a different route. It started at the same point, but crossed the river diagonally to the Quai aux Fleurs on the Ile de la Cité. Along the way, it touched the tip of the Ile Saint-Louis, where the support tower had been erected in the form of a triumphal arch. During 1848 Revolution the southern span was burned, but it was repaired and the bridge was given the name Pont de la Réforme. In 1852, the bridge got its old name back. A demolition decree was issued on August 1, 1860, and the whole bridge was gone by 1862. Why? Admittedly it hadn’t been a particularly handsome bridge. Perhaps it was structurally unsound? 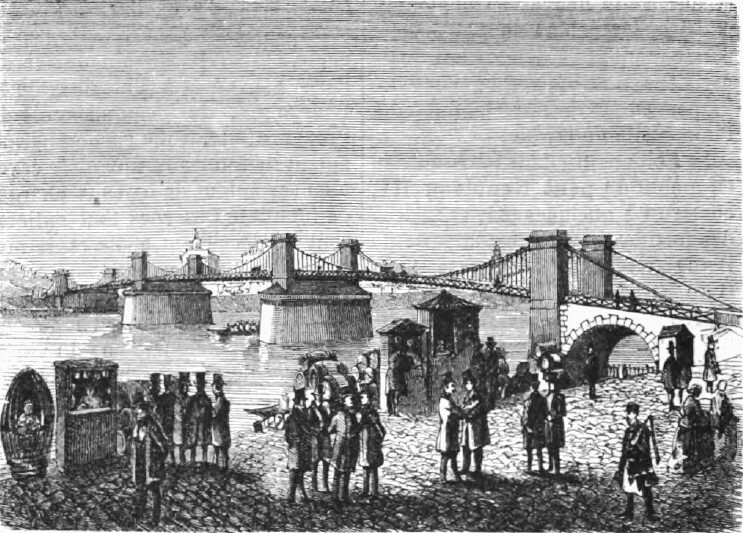 One obscure publication in November 1850 notes that a commission of engineers examined the bridge and recommended that the suspension cables and deck be “tested to insure solidity.” But that is not what really happened. As my interest in Paris suspension bridges grew, I came across the stereoview shown below, showing another suspension bridge in Paris, the Pont de Constantine. Built in 1837 and named for a French military victory in Algeria that year, it was impressive for the time. It linked the Ile St-Louis and the Quai St-Bernard on the left bank. The main span of 333 feet was complemented by two smaller spans of 85 feet. With a width of just under 10 feet, it was a passerelle, or a pedestrian bridge. And in November 1850, it was reported that a commission of engineers had examined the bridge and recommended that the cables and deck be “tested to insure solidity.” Eventually, it was demolished and replaced by a fixed bridge in about 1863. There was a pattern emerging here. Two Paris suspension bridges, built in the 1830s, reported in need of testing in 1850, and gone by the early 1860s. What are we missing? The connection is an event that is little known and rarely mentioned: a deadly collapse of a French suspension bridge that shook the very foundations of French bridge engineering. Because of that collapse, the French halted all further construction of suspension bridges and let other countries assume the lead in suspension bridge design and construction. 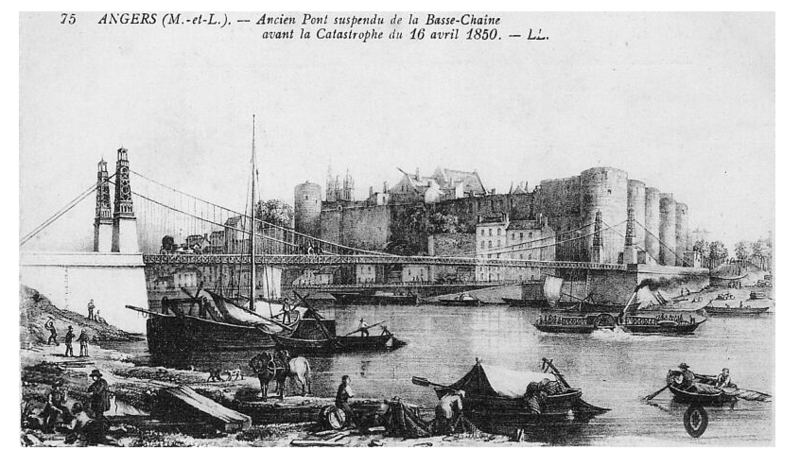 The Basse-Chaine Suspension Bridge over the River Maine in Angers was completed on July 16, 1839. Its 335-foot span served pedestrians and wagons well. The bridge had been built “by two of the most experienced contractors in France who had conscientiously adhered to all the rules of the art as then known” (Tom F. Peters, Transitions in Engineering: Guillaume Henri Dufour and the Early 19th Century Cable Suspension Bridges, p. 169). Today we would call it state-of-the-art bridge engineering. 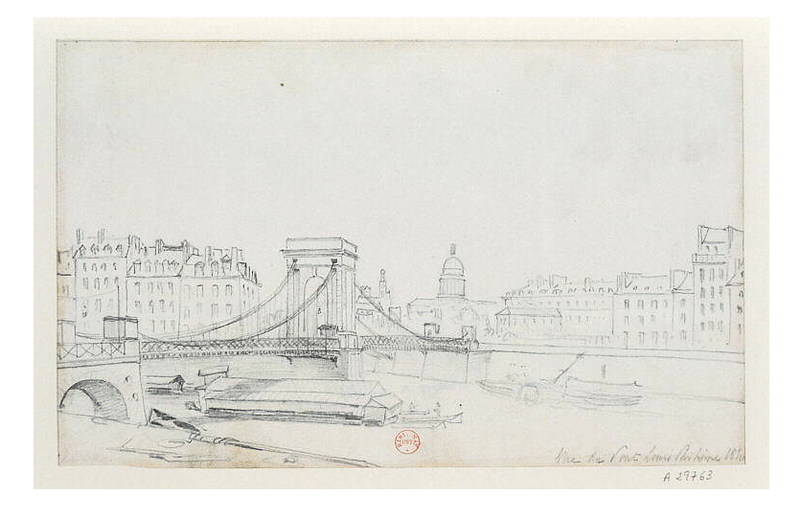 France was the acknowledged world leader in suspension bridge design and construction. Suspension bridges were known to oscillate in the wind and failures were not unknown, but on April 16, 1850, the unthinkable happened. It seems it was a stormy day and the bridge was oscillating. This would not have been regarded as unusual as 478 marching soldiers approached the bridge. But as they crossed, an anchorage tore loose and the deck disappeared beneath their feet; 226 soldiers fell to their deaths. It was the deadliest bridge collapse in history. An inquiry was launched immediately. Its initial findings were disturbing. The bridge had been designed according to the best and most well-proven theories of the day, constructed to the highest standards, and there had been no visible signs of weakness before the collapse. This final finding led to an immediate halt to the construction of further French suspension bridges. Cables carrying the weight of a suspension bridge must be anchored firmly. At the time, there were two methods for building suspension bridges. The British used massive eyebar chains made of heavy plate-iron links. Each bridge was held firm by these giant iron links, which went deep underground into anchorages. By contrast, the French and Swiss pioneered a method of supporting suspension bridges with wire strands or cables, based on the work of engineer Louis Joseph Vicat. The wire cables were split into strands beneath the ground and grouted in place in the anchorages with hydraulic lime mortar. In theory, the mortar would protect the strands from water, rust (oxidation), and any subsequent loss of strength. Since 1831, this had been the approved and near-universal method of building suspension bridges in France. No one seemed concerned by the fact that there was no way to inspect the anchored ends of the cables. It turned out that the hidden mortar did not always cling to the cable, and water leakage was a problem. The cables were rusting and the mortar was failing, weakening the entire structure. The bridge that collapsed had been built according to this widely accepted practice. There had been no negligence, no shoddy workmanship. In the words of the Commission of Inquiry, the “oxidation did not originate in a structural error particular only to the Basse Chaine Bridge, but rather to a structural fault in the system itself, so that it is to be feared that the same result will occur wherever it has been applied” (quoted in Peters, p. 171). Since 1831, hundreds of suspension bridges had been built using a system now shown to be dangerously faulty. Immediately all suspension bridges were suspect. The findings “struck…like a bombshell” and “all bridges built in the previous quarter century, that is, all those with inaccessible anchorage shafts, had to be immediately inspected” (Peters, p. 171). 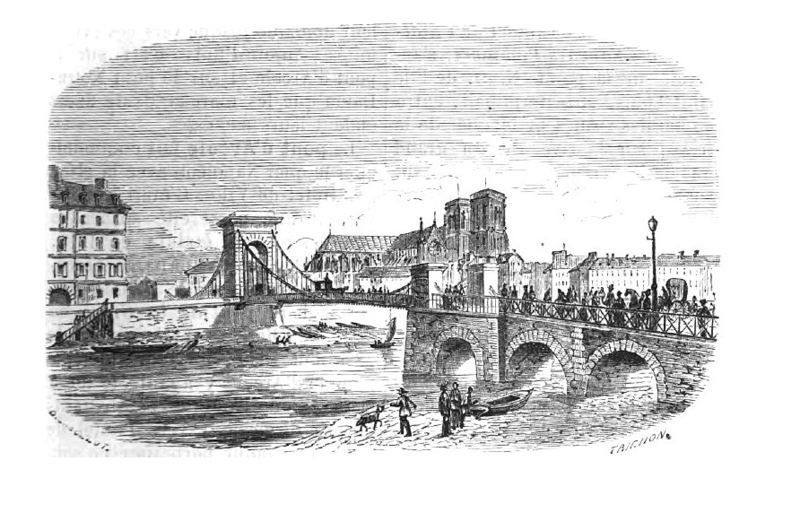 Hence those inspections of the Paris suspension bridges in November 1850. During the next 20 years, there was an official moratorium on suspension bridge construction, and many existing bridges were demolished, like those in Paris. The moratorium was finally lifted in May 1870, by a French government decree. By this time, the French lead in iron cable suspension bridges had passed to North America, primarily through the work of a German immigrant, John A. Roebling, and the American-born engineer Charles Ellet Jr., who had studied at the École des Ponts et Chaussées in Paris. In Paris, even the Bercy Bridge, shown below, was replaced, although it had been built using the British system of eyebar chains. Perhaps it fell victim to the need for bridges to carry more traffic, but likely it was the fear brought on by the deadliest bridge collapse in history. Paris today has little visible heritage of one of the great epochs of French civil engineering. It was only with the work of Gustave Eiffel and Company that the French regained prominence in bridge engineering. But no further major suspension bridges were created in Paris, other than a very small Gustave Eiffel suspension footbridge in the Parc des Buttes-Chaumont. Text by Norman Ball. With special thanks to Roger Dorton, Bob Wilson, Gregor Dallas, and Adam Roberts. This entry was posted in Paris bridges, Paris history and tagged Adam Roberts, Angers, Basse-Chaine Suspension Bridge, Bercy Bridge, bridge failures, engineering failures, Gustave Eiffel, Ile de la Cité, Ile Saint-Louis, Louis Joseph Vicat, Parc des Buttes Chaumont, Pont de Constantine, Pont de la Réforme, Pont Louis Philippe, Quai aux Fleurs, Quai St-Bernard, Saint André-de-Cubzac bridge, suspension bridges, Tom F. Peters. Bookmark the permalink. Absolutely fascinating! I’d never given any thought to suspension bridges in Paris, even though New York City, where I live, has many of them. Our bridges, of course, generally span much wider bodies of water than the Seine. Good catch! We’ve fixed it. Once again, a fascinating piece of research! Thank you. I just love reading about the unique and nearly forgotten Paris of a bygone era that you bring back to life! Magnifique! A very thorough and interesting article! I have been to Paris so many times that I accepted the old bridges and never considered that any suspension bridges had spanned the Seine in Paris in the past. Great photos too! Great piece of considerable interest. Pingback: The Paris Blog: Paris, France Expat Tips & Resources »Blog Archive » Why No Suspension Bridges Over the Seine? The quais of paris are full of mysteries. I live practically on Quai aux Fleurs and if it wasn’t raining right now I’d go out and look for evidence of the suspension bridge. There is a stairway that leads into the water and I wonder if that might have been part of the old bridge? Pingback: Linuxette.org » Qu'advint-il des ponts suspendus de Paris? I envy your relentless research skills…..fascinating article! 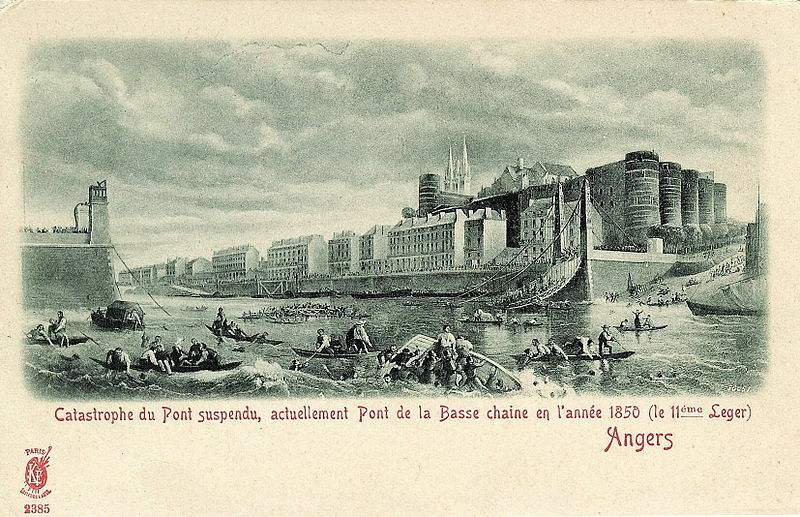 Just one point of clarification… there were several suspension bridges built in France in the 1850s and 1860s following the Angers catastrophe, but nothing approaching the hundreds built in the two decades prior. You might also wish to mention Navier’s Pont de la Concorde, demolished shorly after its completion due to large cracks at the base of its piers. Eda Kranakis’ book “Cosntructing a Bridge, An Exploration of Engineering Culture, Design and Research in 19th Century France and America” has a detailed account. Progress does not stand still, the use of new materials and technologies gives amazing results. (green – because it saves a lot of concrete and reinforcing steel). I’ve found this article to be absolutely fascinating. My family is of French descent and I grew up listening to stories on how our G.G grandfather Prospere Maffrand (who was a civil engineer) HAD to leave France due to a bridge that had collapsed around the 1850s. Finding this information is key to maybe unravel the mystery and put the pieces of the jigsaw together. Thank you so much for sharing! Indeed suspension bridges didn’t work in Paris. Navier designed several that were not a success, My memories are that one was built on the Solferino alignment, one at les Invalides, one at Pont Saint Louis. The foundations at Invalides were undermined by an adjacent drain failure. Then there were problems on the Loire of the brittleness of early steels. There is not enough space in a medieval city to anchor the back ties. Even today some backwaters think that suspension and cable bridges are not appropriate near historical landmarks of the city cf the Ile Seguin.